Typically, school district staff clean cafeteria tables on a daily basis using a bucket and rag. 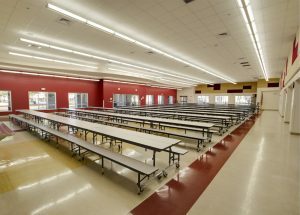 At some schools, there may be more than 20 tables to clean at once, which can be very labor intensive given the limited amount of time to do so. This method can lead to staff cleaning in a manner that includes repetitive bending motions and awkward postures, which can cause considerable shoulder and back strain, and expose employees to cumulative or acute injuries. Many district custodial and food service staff are now using microfiber cleaning systems and a method commonly referred to as “table mopping.” It is a cleaner, more efficient, and ergonomically correct way to accomplish this task. Table mopping involves using a dedicated microfiber cleaning system and a telescoping mop handle to clean table surfaces. By using a color-coded mop pad with sanitizing solution, or separate bucket for sanitizer and rinse water, cross-contamination is effectively controlled. The mop head picks up and stores dirt, bacteria, and germs, rather than sliding them around. This system greatly reduces awkward postures by allowing the employee to stand in an upright, neutral posture. Additionally, shifting to this system can dramatically reduce the time needed to clean tables, as the large flat mop and extendable handle cover more area, faster. A happy and healthy cafeteria for both staff and students. Want more information on lunchroom ergonomics? Read our article for more tips.